Red Lighted Mirrors Mirror Set Chinese 8mm CF250 50cc 125cc 150cc 250cc Scooter by scooter at Joes V Cycle. MPN: Scooter. Hurry! Limited time offer. Offer valid only while supplies last. 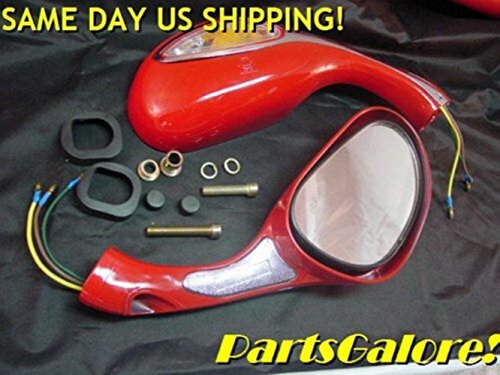 Red rear view Mirror Set with red LED running light and amber turn signal light, includes mounting hardware. This style comes OEM on many Chinese Scooters but they can be used on just about anything with 8mm RH mounting threads. Wiring: For most applications just simply match the wire colors. Green is ground, Yellow is signal & Brown is running light (yellow and brown are reversed on some mirror sets). Just make sure your signals flash amber. If the signals flash red just reverse the yellow & brown wires. There are 4 mirror mounts threads combinations used: Be sure to check the mounting threads on your machine to be sure you order the correct mirrors.